Remote, spectacular and utterly unique, the Galapagos Islands are a 'once in a lifetime' destination for anyone interested in the natural world. 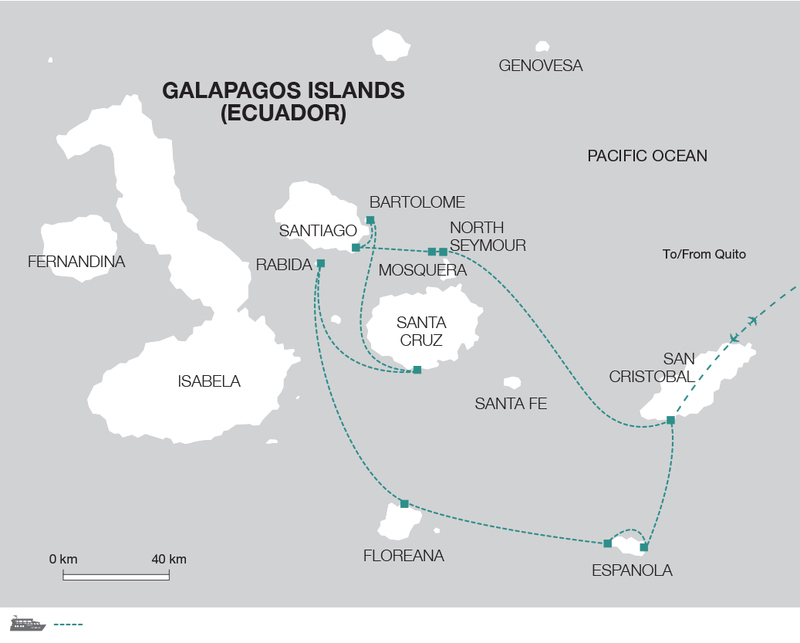 Join us on our best value Galapagos seven-night cruise as we sail to the southern and central islands. Visit a saltwater lagoon and view a colony of sea lions on Rabida Island, encounter large colonies of marine birds and relax on the sandy beaches of Espanola. On arrival in San Cristobal, we will meet our naturalist guide and transfer to our home for the next seven nights, the Xavier III. San Cristobal is the easternmost island of the Galapagos archipelago and one of the oldest geologically. The principal town is Puerto Baquerizo Moreno, the capital of the Galapagos. After lunch we will visit Isla Lobos (Sea Lion Island). This island is located in a small channel off the San Cristobel coastline and is home to a noisy population of frolicking and barking sea lions and is also a great place to watch nesting frigatebirds and blue footed boobies. In the afternoon, we will visit Mosquera Island, situated between North Seymour and Baltra Islands. A stroll down the beach will enable glimpses of brown pelicans, blue footed boobies and sea lions. In the afternoon we may have the opportunity to visit the highlands and see giant land tortoises in the wild. In the morning we will take an excursion to Rabida Island, where we will land on a red sand beach. From here a short trail leads to a salt water lagoon, often home to wading flamingos. Another trail goes past the lagoon to the interior, where the revered Palo Santo trees grow. When burned, the branches of this tree give off a pleasing aroma and ward off mosquitoes. Back on the beach among low-lying bushes nest the prehistoric-looking pelicans. This is the best area for close viewing of these nesting birds, and it's a rare treat to watch parent pelicans return with gullets full of fish for the squawking youngsters. We visit Bachas Beach in the afternoon, located on the northeastern tip of Santa Cruz Island. This is a great beach to stroll on with crystalline waters perfect for swimming; Bachas Beach also gives us the opportunity to see frigate birds, blue-footed boobies and sea lions. Then in the afternoon, we sail to Garner Bay, an excellent swimming and snorkelling site. The Xavier III offers a clean and casual setting with all the necessary comforts. It is staffed by experienced crew members, including a certified naturalist guide. Additional vessel features include a sundeck, dining room and bar. All cabins have side by side berths, private bathrooms and air conditioning. All meals are provided and are served aboard the vessel. There is an interior lounge on the main deck with a TV and DVD player for briefings and presentations. Snorkelling equipment and beach towels are included at no extra charge and wetsuits are available to rent. At times, when the Xavier III is being serviced, we will use another boat of equivalent standard and size. On this tour, the price is based on a lower deck cabin. You can upgrade to an upper deck cabin if you wish, prices vary depending on dates and start from £120 per person.